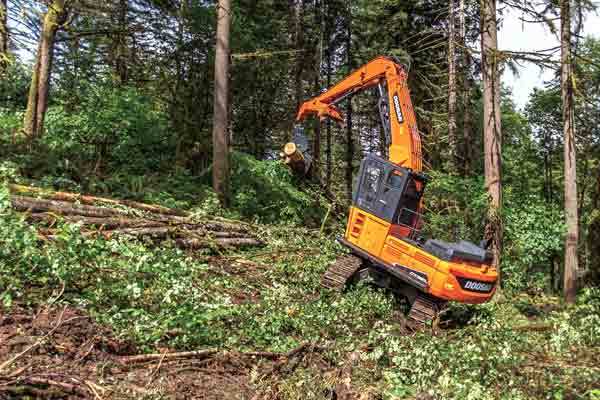 Forestry and logging professionals who desire a larger Doosan log loader to assist with shovel-logging, sorting and log-loading tasks will be impressed with the new DX380LL-5 log loader. 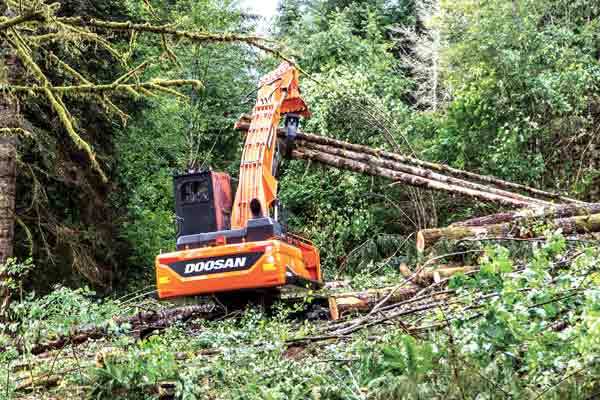 Similar to other Doosan models, such as the DX225LL-5 and DX300LL-5, that have proven themselves as productive, fuel-efficient machines, the DX380LL-5 log loader is designed for demanding logging applications. Weighing approximately 113,500 pounds, and powered by a Tier 4-compliant, 318-horsepower diesel engine, it is the first Doosan log loader in this size class. Production is critical to logging operations, and the DX380LL-5 log loader is up to the challenge. 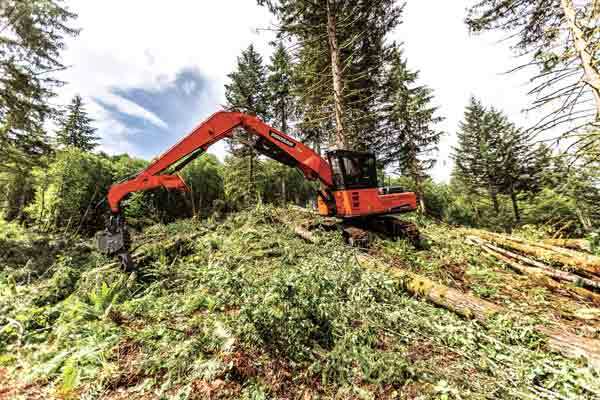 Featuring high swing torque, approximately 44 feet of reach at ground level and powerful hydraulics, the DX380LL-5 is primed for peak performance when working on forestry tracts. Doosan DX380LL-5 log loaders are designed with a log loader workgroup with a live heel. Doosan 360-degree rotating log grapples are commonly paired with the log loader’s live heel to efficiently lift, rotate, move and place logs. To help keep Doosan log loaders running strong and to minimize downtime, the DX380LL-5 is manufactured with heavy-duty components and application-specific guarding. Durable boom, arm and heel cylinder guards, and machine guarding help minimize damage and machine downtime. Doosan log loader tracks are built with heavy-duty links with double grouser shoes and full-length guiding guards. Top rollers are equipped with special clean-out brackets to make routine maintenance simpler. The DX380LL-5 is built with a high and wide undercarriage for excellent ground clearance. It comes standard with a 4-foot forestry cab riser with exceptional all-around visibility, including a standard rearview camera that is viewable from an easy-to-read, 7-inch LCD screen. The LCD screen provides information about the log loader’s engine rpm, battery voltage, front and rear hydraulic pump pressure, and many other critical machine data. For optimal comfort, operators can adjust the suspension seat, headrest and armrest, as well as joystick controls to best accommodate operator preferences. Operators have easy access to routine maintenance areas to increase machine uptime and productivity. DX380LL-5 log loader maintenance features include: centralized grease points, wide side-access doors for cleaning the machine’s cooling system, boom pivot bushings with greasing intervals of 250 hours and a large-capacity engine air precleaner that removes more than 99 percent of airborne particles and extends filter cartridge service life. Doosan log loader operators can utilize a standard auto-shutdown system during nonworking conditions to help save diesel fuel and reduce operating costs. When enabled, the feature will shut down the log loader’s engine when the preset idle time is met. 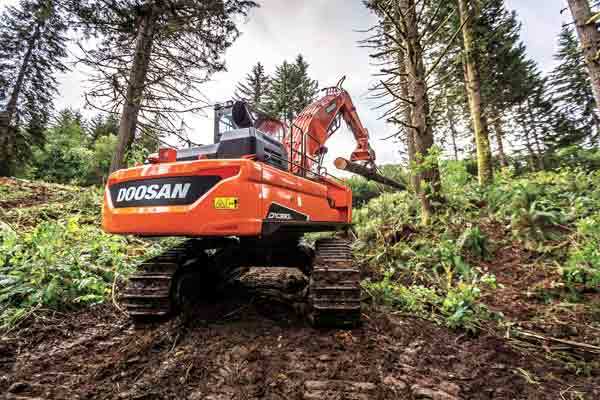 Available as an option for Doosan log loaders, a new rear-entry forestry cab provides easier entry and exit to the operating area, improved operator comfort and better visibility to the tracks and work area. Operators can look through windows in the floor foot pedal area for enhanced visibility on logging sites. The new rear-entry forestry cab will be available for Doosan DX225LL-5, DX300LL-5 and DX380LL-5 log loaders. Additional features include a hydraulic tilt riser for easier transportation on a truck when traveling to and from logging sites. 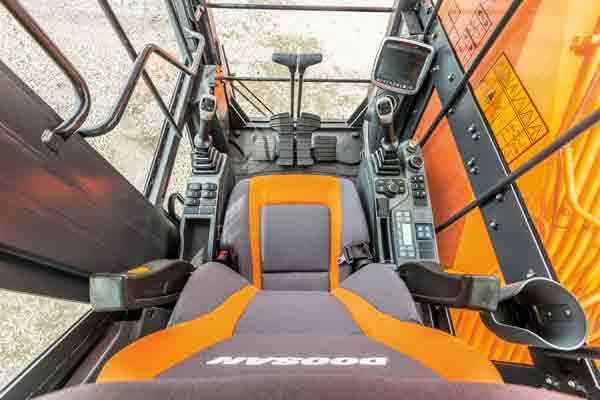 For improved operator comfort, a heated air-ride seat and joystick controls are standard equipment in the updated forestry cab. •	Operating weight: 113,538 lb. •	Undercarriage track length: 18 ft.
•	Maximum working height: 49 ft. 1 in. •	Maximum working reach: 44 ft. 2 in. •	Traction force, max (Drawbar pull): 333,564 lbf-ft.
•	Swing torque: 129,876 lbf-ft.